Home > Market News > China Oil Stocks Rise – Will Demand Fall? China Oil Stocks Rise – Will Demand Fall? Prices rose yesterday as markets continued selling the news of the strikes on Syria. Oil prices ended yesterday more than a dollar lower, closing the day a bit above $66/bbl. 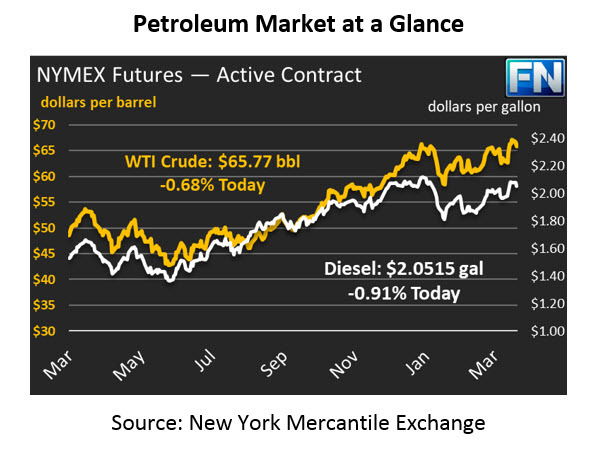 Today, prices are continuing to fall; crude prices are down 45 cents, trading at $65.77. Fuel prices also a bit of a beating yesterday, with diesel prices falling three cents and gasoline prices falling two and a half cents. Today, fuel prices are continuing their descent, with diesel prices currently at $2.0515, a loss of 1.9 cents. Gasoline prices are down 1.2 cents, trading at $2.0278. While markets fixate on draws from American oil inventories, Chinese oil stocks are heading in the opposite direction. With Chinese refinery inputs failing, stocks have risen. China is currently keeping fuel in “floating storage”, offshore barges holding oil. Traders have begun selling these barges due to oversupply on the Chinese mainland, a sign that China’s strong pull on oil supplies may be weakening. China hit record high levels of imports in January and has surpassed the U.S. as the world’s largest exporter. At a time when supply and demand are roughly in balance, any sign of weakening Chinese demand could send markets lower. At the same time, ED&F Man reports that Chinese officials want to increase strategic reserves by 30% relative to last year, so don’t expect demand to weaken too significantly. China’s goal is to have 500 million barrels of oil in storage; they currently have just over half that. Chinese demand will likely continue despite high inventories, helping absorb excess supply produced in the U.S.
How do trade threats tie into this strategy? The U.S. and China continue down the path of escalating trade barriers. The latest volley has been Chinese tariffs on American sorghum production (used for feeding animals and brewing alcohol). Traders fear tariffs could eventually be applied to crude oil, cutting China off from cheap oil supply and creating an oversupply (and lower prices) in the U.S. Because of this fear, some traders in China may be hoarding excess supplies in inventories, to help weather disruptions if American supplies are cut off. This hoarding pattern could be partially responsible for the significant rise in Chinese inventories.